How to get the best items within the first hour of gameplay. For the purpose of this guide i will be using the tokarev pistol because it can be easily farmed from the first civilian quest. 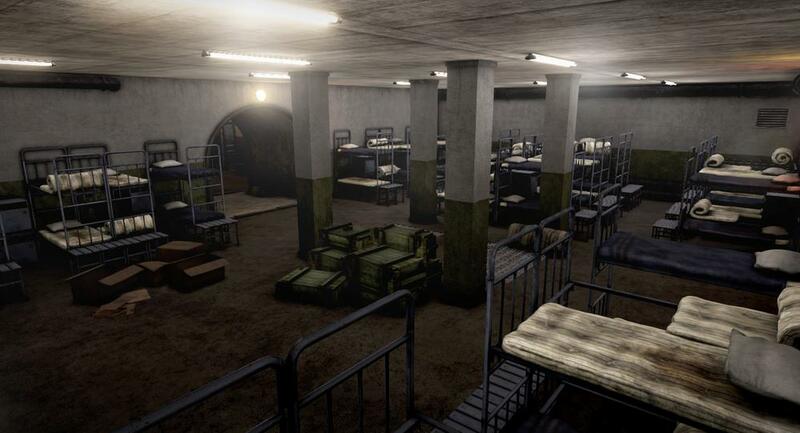 If you are going to the bunker for the first time definitely bring some first aid kits and bandages. Best weapon in my opinion is RPK. Each magazine carries 75 bullets. 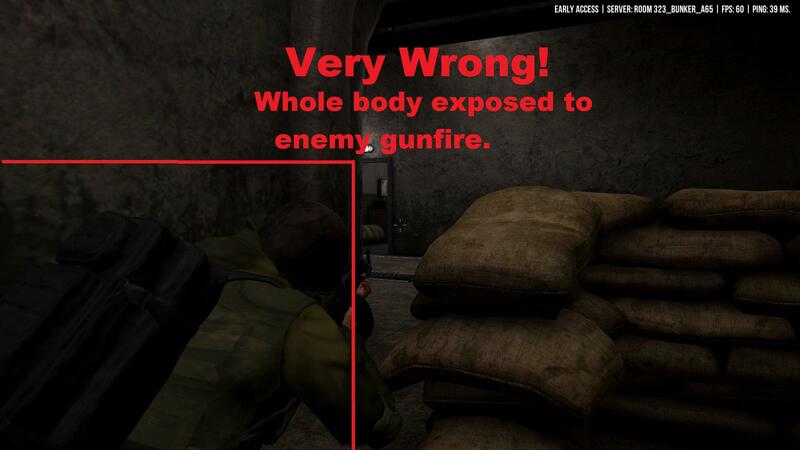 And you will never run out of ammo because half the enemies in the bunker have RPKs which can be looted and unloaded. In this guide i will be using 1 to enter and exit. It is very important that you use the cover spots properly. Failing to do so will almost always lead to death. There is a sweet spot that allows you to shoot out of cover while the enemy cant hit you. 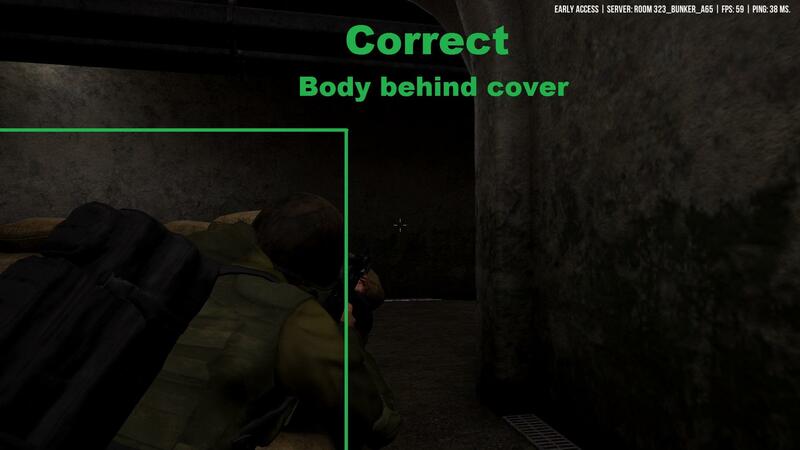 Hold alt to look around corners and get a better view when behind cover. The enemies in section 1 to 5 are grouped together. Shooting one will alert all of them. I recommend you stay behind cover (blue lines, arrow showing direction you should face) until all enemies of a section are dead. Always count your kills. You do not want to run into an enemy by surprise, it usually doesnt end well. 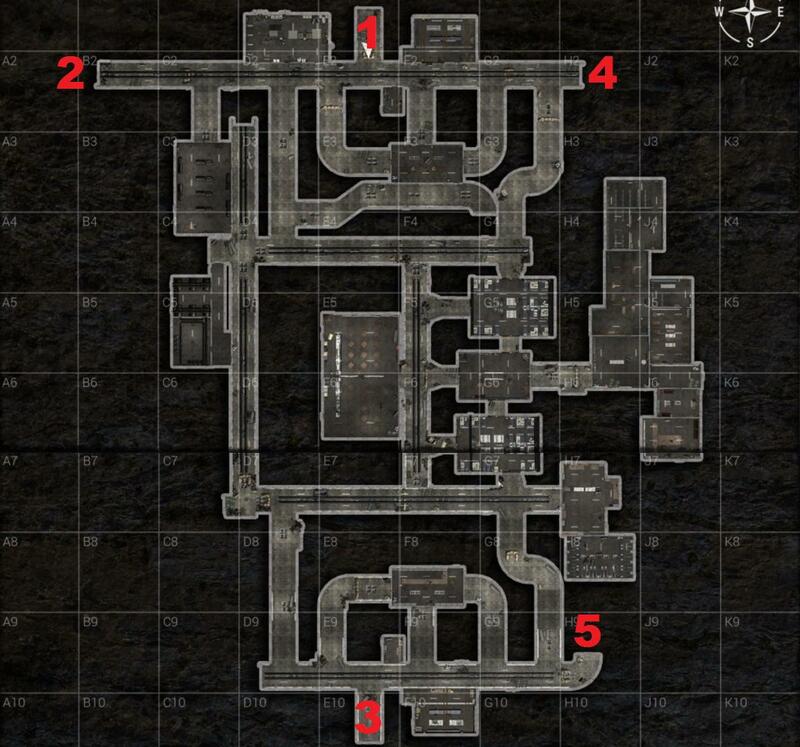 The single enemy in G3 will patrol this part of the corridor. Shooting him will not alert any others. 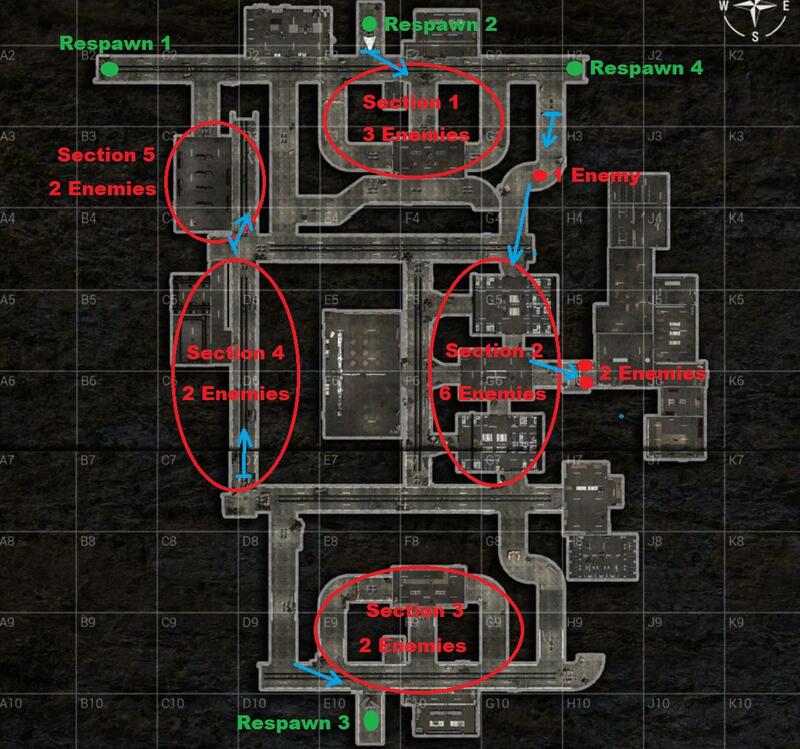 The two guys at H5 & H6 never leave their post and can be easily killed through the open door once section 2 is clear. By the time you complete a full circle, the enemies at the entrance will likely have respawned so better be careful when leaving. 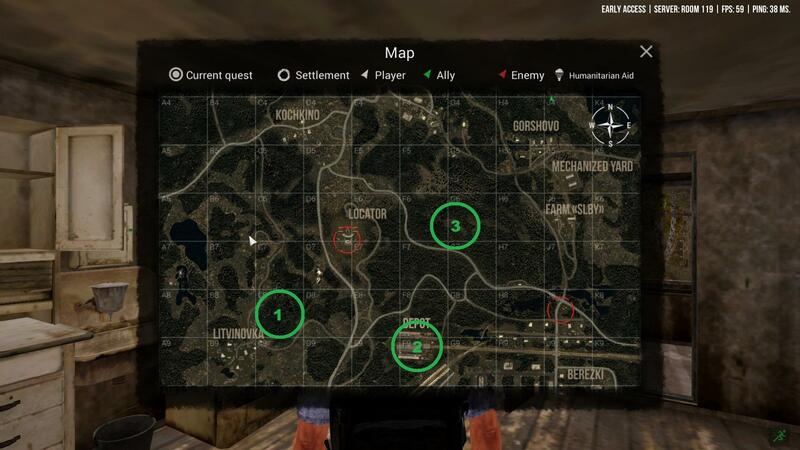 Armor and Clothing can mostly be found in the green spots. 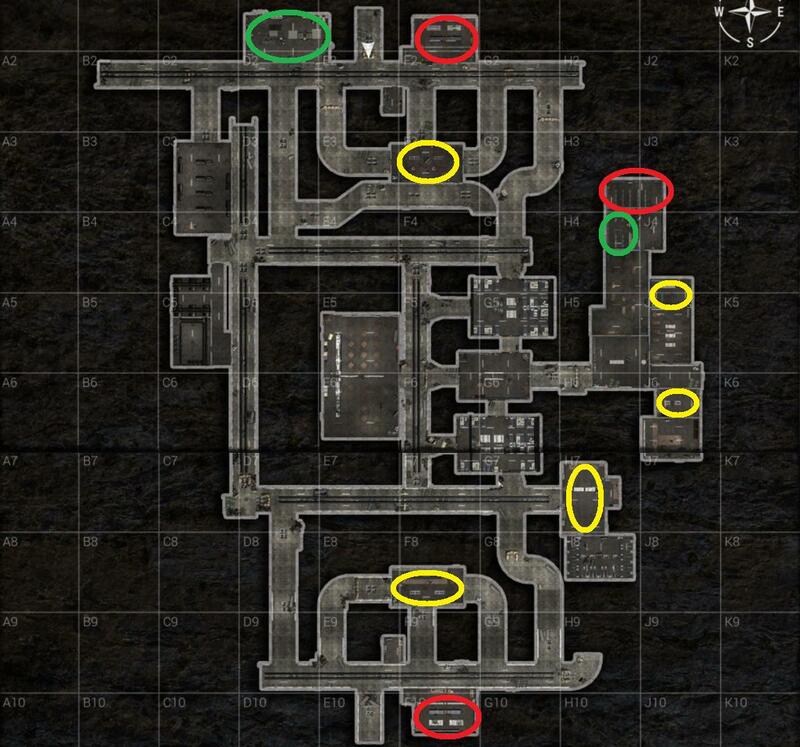 Red shows Weapon and Ammo locations. Gauss rifle can spawn there. 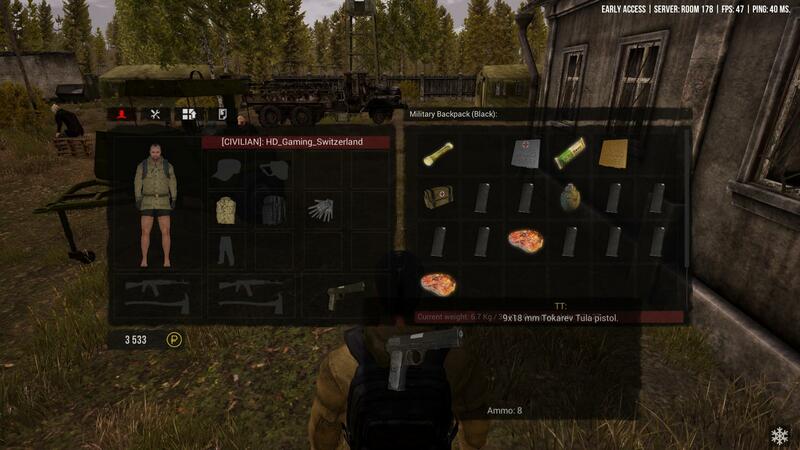 Yellow are other items including food, medkits and vehicle parts. Can also spawn ammo. The best strategy for finding a gauss rifle is to log out in the red marked room at J3 and just hop from server to server until it spawns infront of you. But beware, fighting your way out of this room is much harder than going in. And if you die there, with all the other enemies respawned, you have 0 chance of getting your items back.